Were you wondering how ExchangeLeads new technology can help your business? Have you ever thought about the cost differential in your email marketing budget? 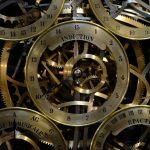 How about the time constraint that regular lead generation causes? Well, look no further! This case study will provide you with all of the information you need to see the benefit of exchanging your business leads! Email marketing, whether you’re establishing a new list of customers or upselling to long-standing clients can have a few problems: bounce-back or de-duplication. Bounce-back has two different routes: hard or soft. A hard bounce is when an email has been returned to the sender and is permanently undeliverable. A soft bounce, on the other hand, is an email that gets as far as the recipients server (i.e. it recognizes the address) but it goes undelivered to the intended recipient. The most common cause of a hard bounce back is having an invalid email address. This can occur if your domain name doesn’t exist, there are typos, changed addresses, or if the intended server has blocked your server. A soft bounce, the type you’ve most likely experienced with your own emails, is caused by the recipient’s mailbox being full, the server being down, or swamped with messages, or the email being too large. Unlike personal emails, when a marketing professional sends out a mass email, it’s very difficult to determine why it has bounced. This is where ExchangeLeads’ technology comes into play. In general, purchased lists have an average bounce-back rate of 25%. ExchangeLeads software drops that rate to an average of 5%! Since missing information and inaccurate fields can cause bounce-backs, it’s important to validate every lead. The technology presented by ExchangeLeads’ provides validation of all fields before being accepted into their database. This is an instantaneous way to lower bounce-back rates – essentially, a more proactive approach to flagging, human error, and technical glitches. In addition, when you purchase marketing lists, it’s often a 2 – 3 day turnaround; with the instant validation check by the ExchangeLeads technology you can have your B2B leads right away – 24/7, when you want it! With that said, purchasing marketing lists can run you anywhere between fifty ($0.50) cents and one ($1.00) dollar per contact – expensive with low or even unpredictable, unclear, unstable return on investment (ROI). At ExchangeLeads, your B2B leads are FREE, and we will take care of the “lemons”, or the leads that aren’t working for your business anymore. Another issue with purchasing marketing lists is that you may enter into contracts which may not result in acceptable ROI. With ExchangeLeads, you have no contract, we provide you with the opportunity to choose your own subscription – saving you money. We believe, when it comes to lead generation tactics and techniques, one size DOES NOT fit all. 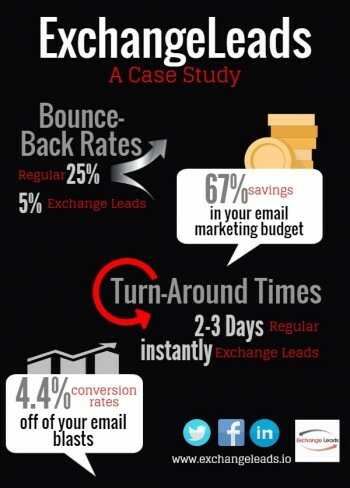 The ExchangeLeads’ technology gives you an opportunity to save 67% on your standard email marketing budget by exchanging your old B2B leads for new ones. On top of that, ExchangeLeads can guarantee a 4.4% per cent increase in conversion rates of email blasts. Think of it as opting out of bounce backs and opting in for buy backs – hence our name ExchangeLeads.